Has your previously mellow and happy baby turned to throwing an all-nighter and crying throughout the day, too? The chances are that you are dealing with teething, if your baby is around five months old. Besides crying (and therefore, pain), signs of teething include drooling, bulging gums, and chewing on things. Giving a pain reliever and fever reducer like Tylenol, but speak to your baby's pediatrician first. 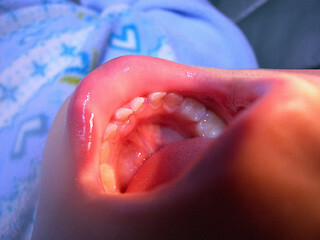 Rubbing teething gel on the gums, but they can come with side effects. Again, consult the doctor before trying this. Breastfeeding as much as your baby wants. Wearing your baby in a baby carrier. Being close to you may soothe your baby. Some parents try homeopathic teething remedies. Placing an ice cube on your baby's gums for a while. Some teethers can also be placed in the freezer for the same effect. I have been through the teething process twice now, with my two children. With my daughter (the oldest), teething rings were my preferred approach. I was afraid of giving too many over the counter drugs, and heard bad things about teething gels too. My son experienced teething pain a lot more intensely than my daughter, so I opted to by homeopathic tablets for him. Let one thing be clear I don't actually believe in homeopathy, at all. But none of the ingredients of these tablets were harmful, and they actually seemed to be very effective. This is, my baby would stop crying the minute he got a tablet. Might have been the placebo effect. Who knew that works for the tiniest ones, too? Need more information about toddler-safe environment! ?? About Gums....please Help And Read! Worried Here! Need practical advice, how to make child to like carrot? bleeding gums, what do I do?